Ok! We’re all friends, right?! Because I am stripping it down and showing you the just out of bed, no make-up version of me. Not my comfort zone but want to keep it real with how I take care of my skin and a little bit of my beauty routine. No joke, I grabbed a cup of coffee and let the hubs snap away which was awkward to say the least. I have been using Colleen Rothschild products for quite some time now and definitely have my favorites. It’s also their Friends & Family event so it’s a good time to share what work for me. By they way . . .the secret to keeping my white bathroom towels white is down below! I’ve blogged about my skin troubles before. I don’t have perfect skin and have always struggled with both acne and rosacea. You can see that my cheeks look a bit pink. I just thought I had rosy cheeks. LOL. My dermatologist let me know otherwise! Ha. It’s been a process, but finding good skin care products coupled with makeup that works for me and my skin has really improved. On top of taking care of my skin, exercise and drinking water really do make an impact. When I stop doing either of those things I start to see more break-outs. If you head to Colleen Rothschild site, you can actually shop products based on your own skin needs which makes it nice. Ok. Let’s talk about my favorites. There are products I use daily and some I use weekly. 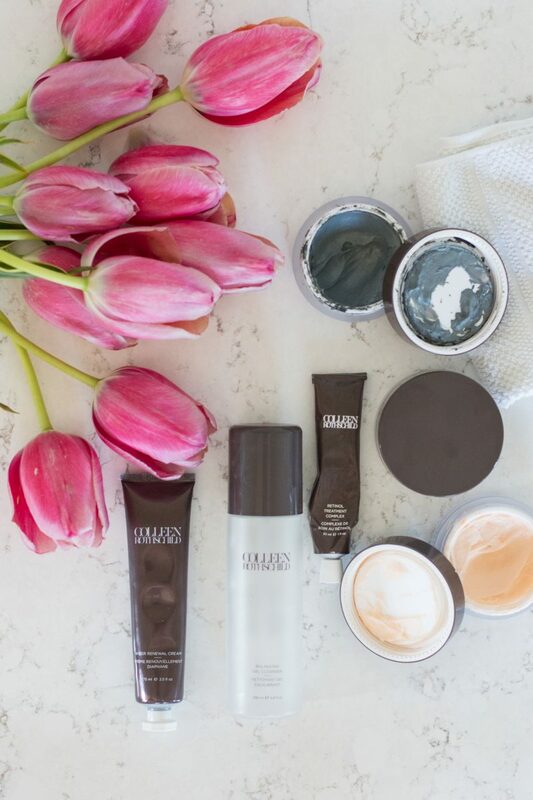 The Radiant Cleansing Balm is the peach one. So good. Helps to clear pores and removes all of my makeup. I use it with the cleansing cloths which are awesome. I definitely have my favorites and I am breaking it all down for you below. 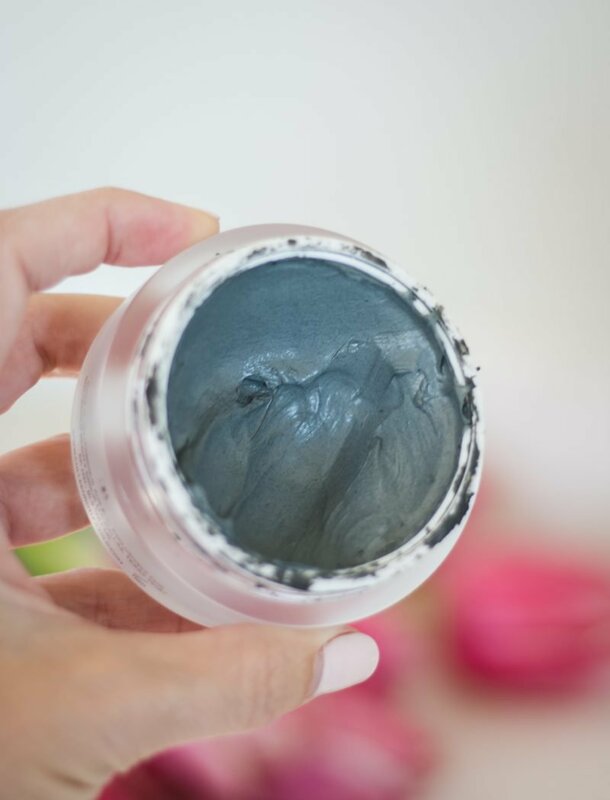 THREE – Sheer Renewal Cream: Really like this because it is oil free. It helps with cell turnover and I usually put it on at night before bed. I always feel like there are so many products out there and I don’t know what they do. What I appreciate about Colleen’s approach is that she breaks it down so you know exactly how to use the product and how it will help your skin. Each item comes with a cheat sheet card which I reference often until the routine becomes second nature. I just recently ordered the Mandelic Acid Radiance Serum. It is supposed to help with skin tone and texture, cell turnover and acne. I will let you know what I think after I use it for a bit. So far so good but I have only used it for about a week. This is for sure my favorite. I LOVE this mask. I have been using it for a couple of years now and it is fantastic for my skin. I’m not getting any younger and taking the time to take care of my skin has become a major priority. 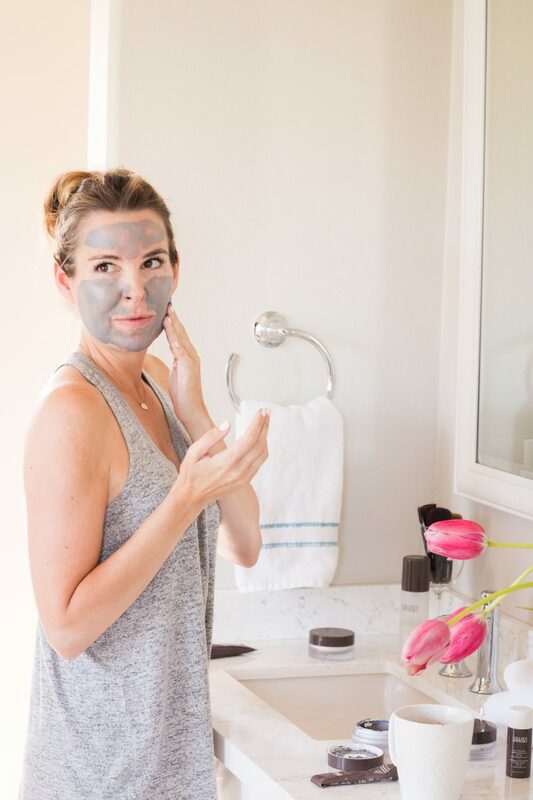 I always try to remove my makeup and cleanse my face before we relax for the evening. I find that if I wait until I can barely keep my eyes open I wash off the makeup and call it a night. This mask is one that I put on once a week. It feels incredible and I actually look forward to the one night a week that I put it on. Plus my kids think it’s hilarious. I usually put it on and then read a story with my son. He’s gotten so used to it that it’s normal now! The great thing is that you can get 25% off right now. The sale goes through SUNDAY. Awesome time to give something a try. I just bought my sister a set of the cleansing cloths because I am dying for her to try them. They seriously saved my white towels. Switching up my makeup routine has been a game-changer, too. I am head over heels for this line and am so thankful to have found a light-weight foundation that stays looking good all day. If I am just running some errands I will keep my face make-up free and just add a the shape tape under my eyes and on any blemishes. But serious love for both of these and my face has been so much clearer since using these. I’ve mentioned before that my skin tends to be a bit oily. As far as the colors go, I use Medium Sand when I am tan and Light Neutral when I am more pale. So there you have it, my friends. I bit of how I take care of my skin and the products that have helped me. Have you tried any of these? Now I think I’ll go put on some makeup! Have a great day. Off to spend time with my sweet mom. *Affiliate links used. 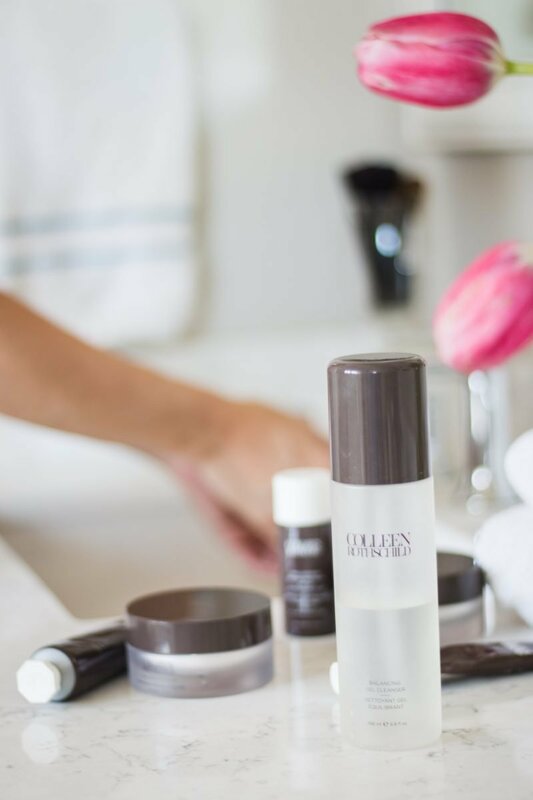 Proud to partner with Colleen Rothschild on this post because I truly am thankful for her products. They sound like amazing products – we don’t get them in South Africa! Courtney, my husband has pretty bad rosacea and is finally fed up enough that I think I could get him to try a product for once in his life. Do you think the mask you feature here might help? On the CR website, that isn’t one of the ‘concerns’ you can filter by. Thank you!!!! It can be so frustrating. I would recommend starting with the dermatologist. I had a topical cream back in the day that really helped. While I no longer use it, I find staying away from Parabens and taking good care of my skin has maintained the results. I hope that helps. Feel free to email me with any other questions. I have been using almost all of the Colleen Rothschild products for about the past year and love them all!! That makes me happy to hear. I’ve been thrilled, too. Have a wonderful weekend. So I have really been trying to find more “clean” products to use. I’ve heard a lot about Colleen Rothschild. Do you know if they are free of the harmful chemicals or not? Hi Sheila! I totally understand and have been trying to do that, too. What I like is that you can see all of the ingredients for each product on their site. I have been avoiding all parabens in my beauty products and makeup and that is an ingredient they avoid. Hope that helps. Hi there! 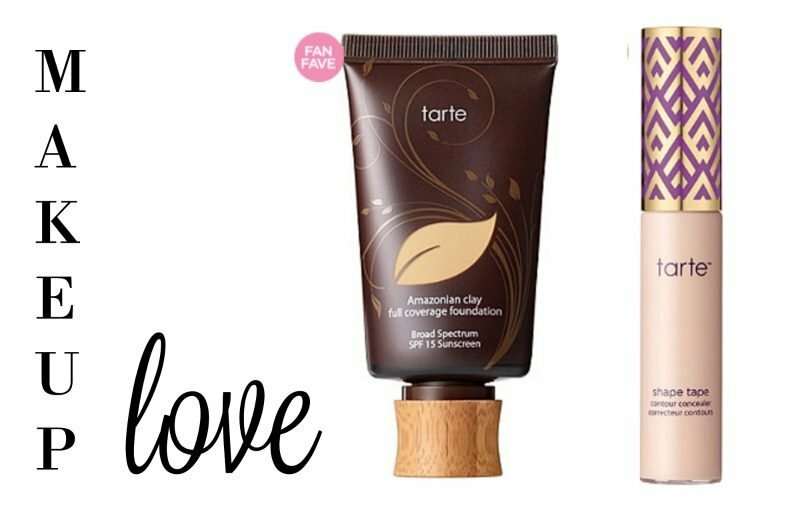 I love Tarte make up and I have used that foundation for years. I too have very oily skin, large pores, and mild rosacea. I recently switched foundations to L’Oréal infallible pro matte. I use it with the smash box purple primer (can’t remember the exact name). This foundation feels lighter to me and lasts even longer than the Tarte foundation and my face is less oily.. If I need to wear sunscreen I use the Cotz face sunscreen underneath. The minimal amount of sunscreen in the Tarte foundation really isn’t enough to protect.